Nyasha’s birth certificate says that he is 13 years old but he is very small for his age. Several months ago his mother died from AIDS being the only surviving child, he was very lonely and sad since his father was working and away much of the time. When his father became ill and could not get out of bed Nyasha cared for him as best he could but with very limited recourses he could not do much and soon his father died as well. 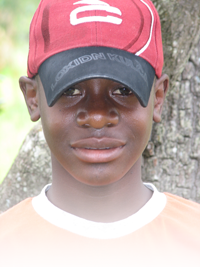 Nyasha had no idea what to do, as he had no money to bury his father and no one to turn to. For three days he sat in the house with his dead father, alone and afraid. Soon the neighbors wanted to know what the horrible smell was and called the police to come and investigate. No one in the village could help with the cost and the police had did not have the money either. Finally, a catholic priest was summoned and he paid for the burial and took poor Nyasha to Newstart Children’s home. The poor child was sad, dirty, and covered with sores, and completely alone in the world. He was lovingly welcomed, washed and anointed with ointments, and slowly the sad, lonely boy has become the beautiful, healthy, happy, helpful child that you see in the pictures. In our home, God works miracles and daily changes lives. I like staying at Newstart because it is a good place with loving and caring parents which the Lord gave them to us. I appriciate everything which the doners are sending to us and also the visitors and our friends from other countries. Newstart is a good place to stay because we learn many things about God everytime. They also teaches us to behave and to have good manner. And they encourage us to study hard so that our lives will be better when we grow up. When I grow up I want to be a nurse and I know God is going to help me so that I will achieve my goals.